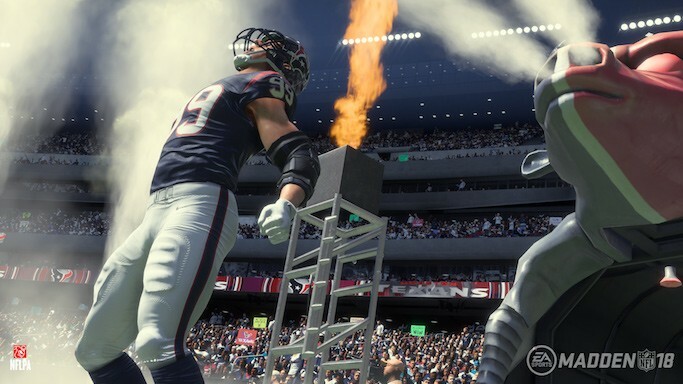 Madden NFL 18 is an American Football game that has a variety of different game play styles. You can either play with friends in franchise mode or play now modes, play solo and even play Madden Ultimate Team (MUT). Electronic Arts (EA) also added a new campaign mode called Longshot. The game has many different modes that are extremely fun. It has good graphics, decent commentary, and a somewhat large music playlist. Furthermore, Franchise mode is fun to play with friends or by yourself. EA did a good job on MUT in this years Madden. EA failed at All Madden this year by making your team almost disabled. Instead of making the computer make smarter decisions they made your team sub-par; still too many dropped passes and ridiculously bad throws. Also, there is no draft in Franchise Mode when playing as a player. Moreover, Longshot had bad graphics and the story-line was OK at best. They missed out on all of the wonders they could have done and this is probably due to having no competition in their market. Madden NFL 18, overall, should be purchased when on sale unless you are a big MUT fan. If MUT is why you play then you should purchase Madden NFL 18.